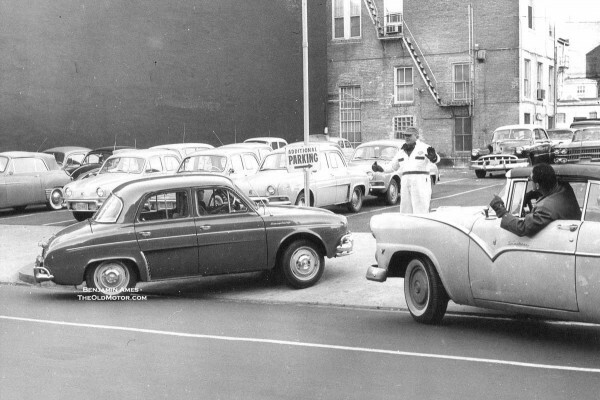 Preferential Parking in Washington, D.C.
At first glance, this might look like the front line at a Renault dealership but the caption that accompanied this press photo explains that it is really a parking lot in Washington, D.C. in 1959. In order to maximize profits, the owner, a Mr. L.B. Doggett, Jr., hit upon the idea that if he could squeeze two small cars into a space usually occupied by a large one and charge the owner slightly more than half price, not only would he make more money per square foot but the car’s owner would be happy with the discount. There was no mention about how this arrangement went over with drivers of bigger American cars, but the fellow in the Ford convertible on the right seems none too pleased. Photo courtesy of the Benjamin Ames Collection. This entry was posted in Auto photos 1946 - 1965 and tagged 1959, Ford Sunliner, Renault, Renault Dauphine, Washington D.C.. Unless this parking lot was very close to the French Embassy in DC, I would suspect that all those Dauphines parked in one place was not a complete coincidence! In addition to the VW’s in the photo, there is that Hillman Minx drophead on the left. As for the very dirty ’55 Ford Sunliner on the right, now it would be worth serious money but, in 1959, it was just a used car. Interesting to see all those Dauphines. I remember reading they actually outsold VW back then. I remember they were calling for a boycott on those Dauphines. I think it was caused by France boycotting American goods. LBJ had a “chicken tax” which actually a tax on 25% on imported trucks in answer to Germany’s tax on American chickens as well. The boycott on Dauphines I vaguely remember. I remember a used Dauphine sold by the company where I worked in Davenport IA that was driven about a hundred feet up Harrison St. Hill and it folded in the middle from rusting through the floor pan. I had a Renault Caravelle back in this era. Wish I had something positive to say about Renaults. My Hillman Super Minx at least was super, at least in name. The people I met with the strange cars (at least in the Midwest) I owned over the years made it worth it. Here in my country ,there´s some Hillman Minxes and Commer Vans (derived from the Minx) still daily use.Is such a well made car ,that lasted all those year in very bad roads and scarce maintenance . The Gordinis in my country were or argentine or brasilian makes.I feel brasilian supported better the mistreatment.The last I saw was 5 years ago or so .